With the advancement of technology in the field of medical science; The question of how to develop a better and permanent way to power electronic organ implant and organ assistance devices arises. The existing ones work on batteries so the patient has to undergo an operation every time for a battery replacement. In recent times researchers have found ways to generate electricity from a person's blood sugar, and piezoelectric devices that generate electricity from muscle movement. Also devices that harvest energy from ambient wireless transmission waves. 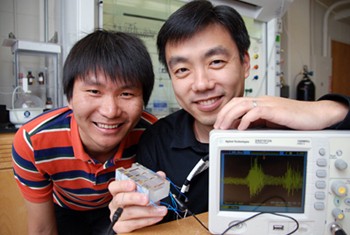 Researchers from the university of Wisconsin-Madison have developed a small device that can generate electricity from human breathing. The team behind the project includes: Assistant Professor Xudong Wang, postdoctoral Researcher Chengliang Sun and graduate student Jian Shi. Now the device harvests energy from plastic microbelt (PVDF MB; ref. the picture above) that vibrates when passed by low-speed airflow such as in the case of human respiration. These microbelts are made of a special plastic called polyvinylidene fluoride (PVDF). Now the interesting thing is PVDF a not only a high quality plastic with exotic properties but also exhibits Piezoelectric properties, what that means is it produces small amounts of electricity under mechanical stresses or vibrations for that matter. The major challenge for the researchers was to create the device small and flexible enough and that is able to make use of the low airflow speed during normal respiration, typically about 2 m/sec of airflow speed. Another challenge was to determine the perfect thickness of the PVDF microbelts so that small vibrations due to airflow could produce a microwatt of electrical energy, that could be useful for sensors or other device implants. Wang’s team achieved this by using an ion-etching process to carefully thin the material while preserving its piezoelectric properties and mechanical strength. The business end of the device is just the blue part or tubular channel shown in the picture, the green part is just a lung simulator. During testing, the device reached typical power levels in the order of millivolts, it reached up to 6 volt during maximum airflow speeds. Researchers believe that the device could one day act as a power source to implantable medical devices. The research was published in the September issue of the journal Energy and Environmental Science.